Rene Burdahl of Innvik, Norway built a sailing canoe (listed here elsewhere) and a 14'9" Lowell Dory Skiff. Rune got the lines for both boats from John Gardner's book Building Classic Small Craft. 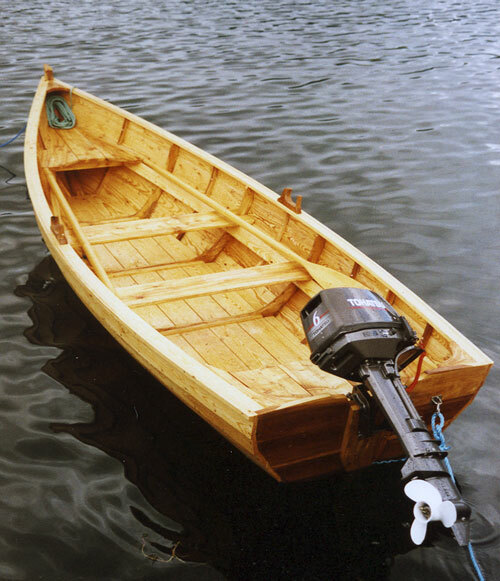 The skiff uses Norway Pine planking, larch frames, seats, and knees. The ribs and modified raised transom are made of elm wood. Transom was modified to take an outboard motor. The skiff is oil finished. Rene is also building a 26' Paul Gartside cutter, using plans from Stimson Marine.